Is there a difference between Power Efficiency and Energy Efficiency? In many conversations here at Intel, we use the terms almost interchangeably. However, after I wrote a blog post about why the difference between Energy and Power matter to the CIO, I started to think about the implications for engineers. Just as the difference between power and energy should matter to the informed CIO, the difference should also matter to the engineers that define and execute strategies to improve server and data center efficiency. A big breakthrough in thinking about server energy efficiency is “Efficiency Load Line” which gauges how well a system’s energy use scales with workload. 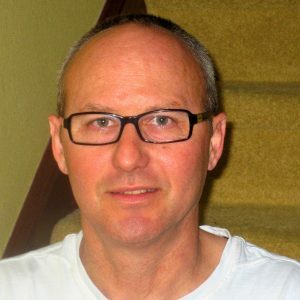 The folks at Google introduced the concept several years ago, and labeled it energy proportional computing. The idea is that in an ideal world if your compute load halves, your energy use should also reduce by half. Of course, in the real world, that’s not the case. There are a variety of reasons for this, but here at Intel we’ve taken the work of “making every Watt compute” to heart. 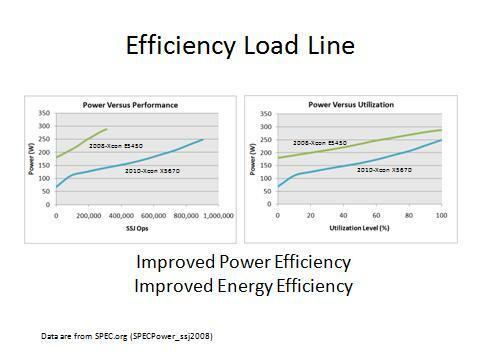 Below is a chart that shows the efficiency load lines of a server built in 2010 versus a server built in 2008. The data shows improvements in both the Power and Energy Efficiency. The diagram below highlights how the Power and Energy efficiency improvement are manifest. 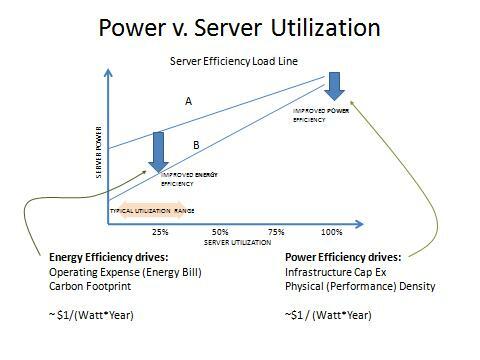 Power Efficiency involves the upper end of the utilization curve. The less power you consume at peak, the more efficient you will be in delivering compute (for the same performance level). On the other hand, the average utilization of your server will typically be 15-30%. This is where proportionality contributes to reduce the amount of energy used by your server. So, what is this worth? The answer is a surprise. As I discussed in an earlier blog, the “cost of power” is the capital cost of the data center, which is typically about $10 Million per MegaWatt. 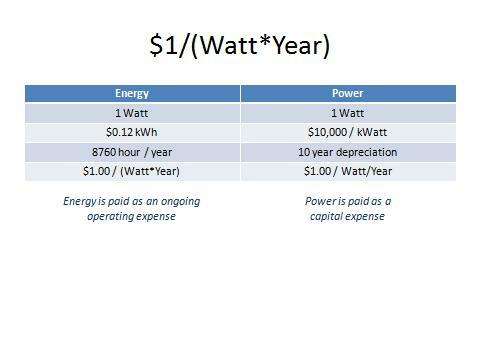 When depreciated over a nominal ten year life, it is about $1/Watt/Year or $1/(Watt*Year). The surprising answer is that the cost of energy based on $0.11 kWh works out to about $1/(Watt*Year). Of course, there can be wide variablility in the numbers. More expensive infrastructure will drive higher power costs, and energy costs vary widely around the globe. Yet this analysis points to a key opportunity in the reduction of operating expenses in the data center. If you recognize and focus on both energy and power efficiency, in a sense you can double efficiency benefit and savings! So, there you have it. Power efficiency and energy efficiency are different. Power efficiency is about doing more within a fixed capability whereas Energy Efficiency is about “making every kWh count” (to be precise). Is one more important than the other? That, of course, depends on the end user’s needs. Nevertheless, I highly encourage you to consider both on your next server purchase. Previous article:The cloud is not all rainbows and unicorns.